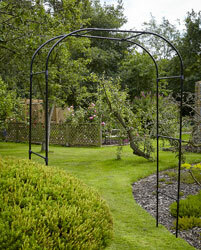 This selection of garden arches are designed to help climbing plants cling to the arch sides. These lattice sides with grid wire section offer the maximum of support the growing climbing plants. Manufactured from heavy-duty steel tubing with black powder coating to help prevent rusting. This Tresco garden arch with trellis sides help plants cling as they grow, adding floral framework and foliage around the arch. 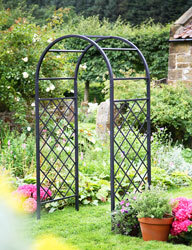 This trellis arch is a gothic designed arch with two finial tops. This outdoor wide arch is manufactured from heavy duty metal tubing. 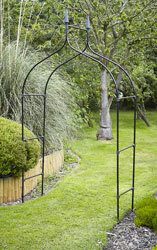 These black metal garden arches are ideal too create a floral framework to pathways and garden entrances. This Abbotsbury wire garden arch with trellis sides help plants cling as they grow, adding floral framework and foliage around the arch. This garden entrance arch is a traditional designed curved top arch. This outdoor arch is manufactured from heavy duty metal tubing. 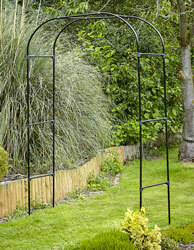 These plant garden arches are ideal too create a floral framework to pathways and garden entrances. This Heligan wire garden arch with trellis sides help plants cling as they grow, adding floral framework and foliage around the arch. This arch for climbing plants is a classically designed curved top arch. This garden arbor arch is manufactured from heavy duty metal tubing. These decorative garden arches are ideal too create a floral framework to pathways and garden entrances. Heavy duty steel fixing feet for the above arches, these allow these arches to be fixed firmly onto hard surfaces. Pack of 4.